7128 Speeder Bikes is a set that was released in Spring 1999 as a part of the Star Wars Episode VI: Return of the Jedi line. 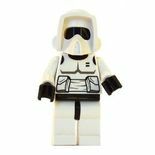 It contains two 74-Z Military Speeder bikes with two Imperial Scout Trooper Minifigures. Also included is a tree and a Luke Skywalker minifigure. The set includes two 74-Z Military Speeder bikes and a tree. The speeders have a brown base colour, with skis on the bottom. Above that is a black 1x4 to hold them on. There are two guns connecting on to two clips. On top of that, there is a brown brick that only comes in a few sets connecting on to the controls. In front of that, there are two bricks with triangular pieces on to them. The speeder also contains a grey backpack, which connects on to a brown brick. The tree is mostly brown, with two leaves on it. Biker Scouts were used to patrol the perimeter of the Imperial Shield Generator Bunker. They were excellent speeder bike pilots and many raced Swoop bikes in their childhood. However, they underestimated the primitive Ewoks, who beat them at the Battle of Endor. This set is based on two scenes in the Episode VI Return of the Jedi movie. The first one is when Luke pursues two biker scouts. The second one is after Luke's bike exploded, in which he took out the last scout trooper with his light saber. This is a description taken from LEGO.com. Please do not modify it. Race through the forest on speeder bikes! On the forest moon of Endor, the best way to get around is on these quick and maneuverable speeder bikes. This pair of flying bikes comes with two scout troopers and Luke Skywalker who's ready for battle with his lightsaber! 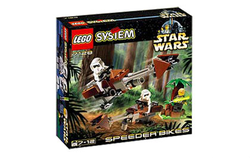 The speeder bikes are similar to the one in 7956 Ewok Attack and 7139 Ewok Attack. Facts about "7128 Speeder Bikes"
Race through the forest on speeder bikes! This page was last edited on 20 April 2019, at 00:16.